The New York Daily News is reporting that TCU has been invited to the Big East and there will be a 1 pm CT announcement today. If this actually occurs as reported, then I’m happy (1) that the Big East has overcome its internal inertia and made the right choice and (2) for TCU fans as that school has truly been a BCS-level program for a long time. I’ll have more as this story develops. Let me throw some spaghetti against the wall here. If I was running the Big East and the members were looking to make a significant move in football but preserve its strength and membership in basketball, I’d turn the concept of football-only membership on its head. Instead, the Big East football members could head the formation of a football-only conference. In essence, it would be a quasi-split – the Big East football members would separate from the conference in only football while keeping all other sports there. This would preserve the 16-team league in basketball and all of the large markets and television contract advantages that come with it. (Note that in my Big East Expansion FAQ post, I neglected to include the Big East basketball contract with CBS in the conference TV revenue figures, which is $9 million per year. That means that each school makes $2 million per year total for basketball between the ESPN and CBS deals, which is actually more than what the football members make for football. This only serves as further evidence that the Big East doesn’t want a full split and will do everything to keep its basketball league together.) There is precedent for this type of structure, where the Missouri Valley Conference and Missouri Valley Football Conference share the same branding and headquarters with several common members, but are operated as separate entities with different charters and voting procedures. Each school would play the 7 teams in its division plus 2 cross-division games, so the wide geographic range of the conference is a lot more manageable than how it looks on its face. (Admittedly, Cincinnati and Louisville would get the shaft in terms of travel under this format, but remember that they had to travel all over the place in the much less lucrative former C-USA that stretched from West Point to Texas.) A conference championship game would then be played (likely at the home stadium of the school with the best record or highest BCS ranking). If I’m running ESPN or another network, this is a conference worth paying some real money for compared to the current Big East or even an expanded 10-team Big East football league that includes TCU. The Big East football members get the benefit of controlling their own destiny for football but still keep their profitable basketball league together. As for what the other schools in this football-only league do with their other sports, the Big East members can legitimately say, “Not my problem.” If this superconference is formed, then this permanently kills the chances of any other presently non-AQ conference like the Mountain West rising up to AQ status, so the stance can be either get onto the AQ gravy train now or forever hold your peace in the non-AQ world. The Big Country wouldn’t make Big Ten or SEC TV money on a per school basis, but it would certainly present the opportunity for a massive upgrade that neither the Big East football members nor the non-AQ schools could hope for in more measured and conservative expansion scenarios. This would make it a whole lot more palatable for schools such as TCU to agree to find a separate home for its other sports in comparison to the good-but-not-great revenue bump that it would receive if it were tacked on as a 10th football-only member of today’s Big East. With other schools such as Boise State looking for a conference for other sports in the same manner, they can all agree to end up in a place like the WAC, WCC or even a brand new conference, which would provide a quality league for such other sports. Do I think that the Big East football members are even considering this at all? Heck no! I’m sure that plenty of people will look at this proposal and perform some virtual vomiting all over it. Yet, when The Big Country is framed and managed as a football-only conference, I don’t think it’s nearly as crazy logistically as it looks on a map. This is a way that the Big East football members can throw in all of their last poker chips on the pigskin without risking anything on the basketball side. In a way, the low revenue of Big East football gives those schools freedom to make moves that would be impossible for the Big Ten and SEC – they have little to lose on the football end, so this is a chance to go for a huge gain that will excite the general public and legimitately change the perception of the league. Regardless, there’s no reason for the Big East football schools to split off (whether it’s just for football or all sports) unless it does so in a massive game-changing way. (1) Mr. Numb Existence – Somehow, I ended up with the Mr. Numb Existence Award this week in the BlogPoll that’s given to the pollster with the individual ballot closest to the overall result. This occurred even though I deviated from the overall poll almost immediately by putting TCU at #2 instead of Auburn. Regardless, and I say this as someone that has long been skeptical about the top-to-bottom quality of the non-AQ conferences, but TCU can and will pretty much kick the crap out of everyone this season. (2) Mo Money, Mo Texas – Shortly after posting this generally blase post about the initially underwhelming projected financial figures for the Longhorn Sports Network, our good friend Chip Brown from Orangebloods.com reported that ESPN came in with a bid to pay Texas $12 million per year, which is a massive game-changing number on its face. This swung the pendulum in the public eye from “Why did Texas do this?” to “Texas could almost afford to pay Cam Newton if it wanted to”. The one reservation people should keep in mind is whether this $12 million per year includes radio and other media rights, as well, which this Austin American-Statesman article intimates. If that’s the case, then the $12 million figure isn’t necessarily that crazy. Ohio State’s radio and multimedia rights deal with IMG and RadiOhio is worth an average of $11 million per year, which is all on top what the Buckeyes receive from the Big Ten TV contracts. It’s unclear how the ESPN arrangement will interplay with the Texas deal with IMG, which is the primary multimedia rights holder for the school and is running the search for the Longhorn Network partner. A question that I’ve been continuously getting is, “Why would ESPN be willing to pay so much for maybe one Texas football game per year and a handful of non-conference basketball games?” Well, one has to consider that since the Big Ten Network has been formed, ESPN has been overpaying for college sports in large part to prevent other conference networks from coming to fruition. Those networks represent extra competition to the Mothership itself along with taking away properties from its ESPN Regional syndication arm. The Worldwide Leader had to pay both the SEC and ACC hundreds of millions of dollars in Godfather offers in order to keep them bolting to competitors and starting their own networks. In contrast, ESPN has just destroyed the chances of a Big 12 network ever forming by paying a mere $12 million per year to Texas. When you look at it that way, $12 million is a complete bargain compared to what ESPN had to ward off potential competition from the SEC and ACC. (3) Return of the WAC – Oh, poor WAC. This summer, it looked like it might nab BYU for non-football sports and possibly start a chain reaction where the Mountain West would start crumbling and the WAC could pick up the pieces. Instead, the MWC embarked on its own smack-down raid by grabbing Nevada and Fresno State on top of conference headliner Boise State and BYU ended up taking its non-football programs to the WCC, which left the WAC wondering if it would even have enough members for a football conference in 2011. It’s been a rough go-around for a non-AQ conference that has sent its champion to BCS bowls 3 out of the last 4 years. Also, as discussed by a number of commenters, Hawaii is possibly the next most likely school to declare independence with a possible home for non-football sports in the Big West. I vacillate back-and-forth as to whether it’s a good idea for Hawaii to become an independent. In theory, it ought to be able to fill out its football schedule because of the extra game exemption provided by the NCAA, but we have already seen the Big Ten schools essentially abandon playing in Honolulu because of a combo of high costs and the desire to play more home games. As more BCS leagues go to 9-game conference schedules, Hawaii is going to face more challenges scheduling AQ teams than before. Finally, who knows whether the Big West schools are really going to be willing to shoulder the costs of sending non-football sports to the Honolulu, which means that Hawaii might need to hold onto its relationship with the WAC. On the other hand, Hawaii is uniquely attractive to a network like ESPN because its home games fit perfectly into late-night time slots on the mainland. Thus, it’s possible for Hawaii to get a BYU-type TV deal in place, which would make it more than worth it financially to become independent. It appears that the conference realignment game will see the most action at the non-AQ level for the next few years besides an addition or two by the Big East… unless it decides to follow one of my “modest proposals” for the league that I’ll present next week. Until then, have a great weekend with Illini-Gopher football, Illini-Saluki basketball, Derrick Rose vs. John Wall and hopefully Julius Peppers decapitating Brett Favre. However, football in and of itself really isn’t what drives money in college sports. Otherwise, the 14-school MAC would be the richest league anywhere and the 12-team Conference USA would be looking to poach the Big East as opposed to the other way around. Quantity does not equal quality, and what TV networks pay for is quality. Instead, it’s the marquee football schools (i.e. Ohio State, Michigan, Penn State, Nebraska, Notre Dame, Florida, Alabama, Florida, Texas, Oklahoma, Miami, USC, etc.) that disproportionately drive revenue and adding anything less than one of those schools is speculative and by no means any guarantee that ESPN or another TV network will pay a single cent more. (Stewart Mandel’s 2007 grouping of the BCS schools into four different tiers is still a pretty good assessment of how where various programs stand in the long-term.) It’s even unclear that the expanded Pac-10 will really gain much (if any) revenue with Colorado and Utah and that’s with the revenue pop of the creation of a new conference championship game. Without any marquee schools involved, we can’t apply the same standards for expansion for the Big Ten or SEC to the Big East. The Big East receives around $33 million per year from ESPN, with about $20 million allocated for basketball ($1.25 million per basketball member) and $13 million for football ($1.625 million per football member). As you can see, basketball is on the same tier financially to the Big East as football. Plenty of people have criticized this fact, but it’s a classic “it is what it is” situation. Without a Notre Dame or Penn State-type addition, the Big East can’t reasonably expect to add any school that adds enough to the football revenue side that would make it worth it for the league to split. The Big East football members make $2.875 million in TV revenue each annually (including both football and basketball). That means a 10-team all-sports league would need to have a total TV contract of $28.75 million compared to the current $33 million contract which includes a whole host of large basketball markets just to break even. Of course, the Big East schools aren’t going to go through the hassle and inevitable lawsuits to split in order to simply break even. The only good reason for a split would be to see a big-time increase in revenue to make it worth it. So, in order to make $5 million per school (which would still be the lowest out of all of the BCS conferences by a substantial amount), a 10-school split league would need a $50 million annual TV contract ($17 million more than the current 16-school contract) while a 12-school league would need a $60 million contract ($27 million more than the current deal). Even if we assume that a split league would somehow lose absolutely no value on the basketball side (and that’s a very generous assumption) and the current 8 Big East football members alone can start at the $33 million level that’s being paid out to the entire 16-team conference, 2 additional schools would need to add about $8.5 million each to the Big East TV contract while 4 additional schools would need to bring $6.75 million each. Is it reasonable to assume that individual schools will be able to bring to the Big East revenue increases that are close the entire TV contracts for the conferences that they would be leaving such as the Mountain West or C-USA? (The MWC makes $12 million in TV money per year for all sports and the C-USA deal with CBS College Sports is between $7 to 8 million annually.) Absolutely not, which is what the Big East’s university presidents understand and why they are adamant about not splitting. This doesn’t even get into what would happen to the Big East’s accumulated NCAA Tournament credits over the past five years, which represent a significant amount of money equal to about five years of BCS bowl payments. The football schools would risk giving all of that up to the Catholic schools in a split situation (since the football schools would be exiting the conference from a legal perspective) and, at the very least, there would be massive lawsuits involved. The Big East football members aren’t stupid enough to get within the vicinity of that type of potential trouble and financial loss unless it’s adding a certain Catholic school from South Bend (which won’t happen). That being said, the value of DePaul and all of the other Catholic schools in the Big East is as a collective as opposed to the individual schools. The Catholic members are what allow the Big East to go into any negotiation and state that it’s the conference that covers the New York, Chicago, Philadelphia, Washington and Providence/Boston markets. Believe me when I say that this fact is pumped up on slide #1 on any Big East PowerPoint presentation and that the relative peanuts that the conference is receiving from ESPN today would be even less without that market argument. The Big East can’t point to massive fan bases or schools like the Big Ten or SEC (and likely will never have any), so the competitive advantage that it has to sell is its presence in nearly all of the largest markets in the Eastern half of the United States. Otherwise, the differentiators between the Big East and C-USA or the Mountain West (much less the other BCS conferences) from a TV perspective are virtually nil. The Big East is still more valuable with the Catholic schools than without them for that reason. 3. Doesn’t the Big East need to protect itself from getting pillaged by the Big Ten and ACC? The bad news in Providence is that every Big East member would jump to the Big Ten or ACC immediately no matter what the Big East decides to do – no expansion decision or financial scheme would ever change that. The good news is that the Big Ten and ACC aren’t interested in any Big East schools. So, for the foreseeable future, the answer to the question is an emphatic NO. Similar to the analysis of the financial prospects (or lack thereof) in a Big East split situation in the answer to question #1 above, the financial incentives simply aren’t there for either the Big Ten or ACC to expand beyond 12 barring Notre Dame or Texas being added. In the Big Ten’s case, each additional school needs to bring in $22 million just to break even in today’s world without Nebraska or a Big Ten title game – that number is probably going to push toward the $30 million over the next year or two in the 12-team league. Once again, the entire 16-school Big East contract is worth $33 million. While the Big Ten Network is lucrative, it can’t perform David Copperfield magic tricks – 2 or 4 Big East schools aren’t suddenly going to be worth $30 million each to the Big Ten when a 16-school league is valued at $33 million total. Similar math applies to the ACC situation, albeit with lower figures in the $15 million per school range. ESPN isn’t going to add $30 million to its new ACC contract so that the league can expand with 2 Big East members (or a $60 million increase with 4 additional members) when it currently can get all 16 Big East members for $33 million. None of it adds up. Therefore, the Big East should be expanding to better itself as opposed to some type of defensive measure against other conferences. 4. Can’t the Big East make up the revenue gap with other BCS conferences by creating its own TV network? Well, a lot of people seem to apply the Underpants Gnomes Plan to the notion of a Big East network, too. Just because a conference (a) starts a network and (b) has teams in certain markets doesn’t automatically mean that such conference network is going to magically get the basic carriage at a high subscriber rate that’s required to make it financially viable. Case in point is the mtn (which is the Mountain West’s network that’s owned by CBS College Sports), which hasn’t been able to get basic carriage in its two largest markets of Dallas-Fort Worth and San Diego. So, if TCU wasn’t enough to get the mtn onto basic carriage in DFW, it’s not going to suddenly get a Big East network on in the same market when the Big East has no substantial alumni or fan presence in that area otherwise. The Minnesota Twins also started a network that ended up folding, and that’s actually a team that legitimately “delivers” its home market. Even the Texas Longhorns network isn’t really going to be the financial boon that many were predicting and there’s no single school in the country that’s better positioned to start one up. Without leverage, you don’t get basic carriage, and without basic carriage, you’re better off just signing a comprehensive deal with ESPN. That leverage doesn’t come in a linear fashion, either – it’s faulty reasoning to say, “The Big East is 50% less popular than the Big Ten in its home area, so the Big East network can just charge 50% less than the Big Ten Network.” Instead, there’s a tipping point where there’s a critical mass of fans in a market that care about the network so much that they will actually leave (not just threaten) their current cable provider for another one that carries the network. At that point, the current cable provider is better off paying up $.70 per month (or whatever the subscriber rate is) to that network than losing more money in cancelled $80 monthly cable bills. The Big Ten and the New York Yankees had that leverage and even they had to endure fights with cable providers for a year or more in order to get basic carriage. That leads to another issue specifically related to the Big East – in order for its conference network to work out in any form, it needs to get basic carriage in the New York City market. Remember that this was a market where Cablevision argued that the freaking Yankees were “niche programming” and there’s already three extremely high-priced regional sports networks (YES, SNY and MSG) to compete with. Frankly, if any combination of Rutgers, Syracuse and/or UCONN was enough to get a cable network basic carriage in NYC, then such combination would’ve been invited to the Big Ten months ago. The problem is that the NYC market is fool’s gold for conferences because the sheer size of it and the way that college sports fans are so dispersed among all of the conferences there means that no single conference could ever get the critical mass required to make a network work in that area. This issue applies to pretty much all of the large markets that the Big East is located in (Chicago, Philadelphia, Washington). The conference has a presence in each of them where they provide value for the purposes of an ESPN national TV contract or signing up the syndicated Big East package with an RSN, but none of them provide the critical mass of fans that would meet the threshold of getting a Big East network basic carriage. Heck, the only Big East markets that I could see as “guaranteed” to get basic carriage are Louisville, Hartford and the state of West Virginia. Pittsburgh and Central New York probably could be added to that list, but everywhere else would be speculative. The Big East has the high population numbers on paper, but not enough fan intensity within that population base to justify creating a TV network. 5. Couldn’t Big East consultant/savior Paul Tagliabue figure out how to create a Big East network? Former NFL commissioner Paul Tagliabue? The guy that took the single most valuable sports property in America and created a network that initially couldn’t get carriage anywhere other than DirecTV, where the NFL has Godfather powers due to Sunday Ticket access? The guy that created a network that couldn’t reach a deal with Comcast until he left the commissioner’s office and Roger Goodell took over? The guy that created a network that still doesn’t have deals with Time Warner, Cablevision or Mediacom seven years after it went on the air? You want that guy giving you advice on starting up a cable network? Seriously?! I remember traveling to London for work a couple of years ago and found that the BBC carries the NFL Network Thursday Night package live. Think about that for a second: people living in the United Kingdom literally have more access to NFL Network games than people in the United States. That’s Paul Tagliabue’s cable network legacy. 6. Why can’t the Big East get Penn State or Notre Dame? C.R.E.A.M. The Big East will get farther trying to ask USC and Florida to join. 7. Why can’t the Big East get Boston College or Maryland? C.R.E.A.M. Note that other than the schools that moved up from C-USA to the Big East, there was no single greater financial beneficiary from the 2003 conference realignment than Boston College. The people that matter at BC are very happy with the ACC. 8. Why can’t the Big East go after the almost-leftovers of the Big 12 such as Missouri and Kansas? First, as I’ve written over the past few months, the Big 12 will be stable as long as Texas wants the league to stay alive, and pretty much everything points to that being the Texas long-term position for a multitude of reasons (TV network, political heat, etc.). As a result, no one should be shortsighted in thinking that the Big 12 is going to collapse at any point soon. Second, C.R.E.A.M. Texas might be a mean pimp a la Wayne Brady, but they’ll pay out juuuuuuust enough money to keep its employees from drifting off and getting legitimate jobs. It’s not as if though the Big 12 has really had completely poor payouts. I don’t buy Dan Beebe’s projections of $452 gazillion per year per school that will all be funded by his multi-level marketing “business”, but even if the Big 12 can simply keep its current payout levels, that will still provide between $6 to 7 million annually for each member. Those numbers far surpass what the Big East can ever hope to provide. As noted earlier, revenue is driven by the marquee football schools and the Big 12 has two of them in Texas and Oklahoma. Regardless of whether UT, OU and Texas A&M have guaranteed $20 million annual payouts, it’s going to be extremely tough for any of the Big 12 schools to leave for a league whose best football anchor is arguably West Virginia. 9. Won’t the Mountain West become an AQ conference in a few years? – My educated guess is no based on the losses of Utah and BYU. Even with the addition of Boise State next season, the issue with the Mountain West and the BCS evaluation criteria will always be with the depth (the performance of the schools from top to bottom) as opposed to the top 2 or 3 schools. Regardless, why would TCU take the risk of that not happening in a few years when it could get into a BCS conference right away? The answer is that they wouldn’t – TCU and any other non-AQ team would jump at any BCS invite. 10. Why the heck would TCU or anyone else agree to a football-only Big East invite? – The crappiest house in Beverly Hills is worth more than the nicest house in South Central LA, and the crappiest spot in an AQ conference is worth more than the nicest spot in a non-AQ conference. It’s a hell of a lot more difficult to find a spot in a BCS football league than a home for basketball and other non-revenue sports. TCU is at its absolute peak in terms of marketability and attractiveness and the leadership there likely knows that it needs to strike it while it’s hot. Any other non-AQ school that might receive a football-only invite from the Big East would be wise to do the same because future opportunities aren’t guaranteed. At the same time, TCU or any other non-AQ school HAS to run the table in order to have shot a BCS bowl bid, and even that’s not necessarily a guarantee if there are multiple undefeated non-AQ teams. Going undefeated every single season is simply unrealistic for even the very elite football programs. In contrast, there’s a fairly good chance that this year’s Big East champ will have 3 losses (or even more). Being in an AQ conference means that a school has some margin for error during the course of the season, which doesn’t exist in the non-AQ world. 11. Won’t TCU try for a Big 12 invite instead? It takes two to tango: TCU can try for a Big 12 invite all it wants but the Horned Frogs will be rejected every time. I’ve said this many times before and I’ll say it again: the single biggest issue with the Big 12 financially is that it lacks viable markets outside of the state of Texas. Putting aside the fact that neither Texas nor Texas A&M want anything to do whatsoever with TCU (which is definitely the case), TCU is simply in the same place with respect to the Big 12 as Iowa State and Pitt are with the Big Ten – overlapping markets will kill any chance of an invite. 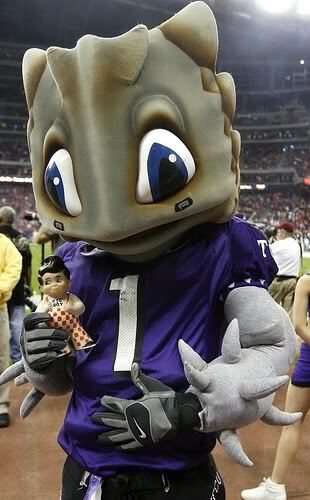 As long as UT and A&M are in the Big 12, TCU will NEVER receive a Big 12 invite. Big East schools don’t have to worry about TCU bolting down the road. 12. What do you think will happen even though you have the gambling skills of Charles Barkley on a bender? I believe that the Big East will do the right thing and invite TCU as a football-only member, with TCU sending its non-football sports to the Missouri Valley Conference. (Note that under NCAA rules, a school cannot play its non-football sports in a league that sponsors football when its football team plays in another league. Notre Dame is compliant because its football team is independent. Thus, the WAC, C-USA or staying in the MWC for non-football sports aren’t options for TCU. The Missouri Valley Football Conference exists at the FCS level, yet it’s administratively a separate league from the MVC despite having common members and sharing the same branding and headquarters. Not to open up another can of worms, but that MVC/MVFC setup might work for separating the leadership of the Big East football and non-football leagues in the future while still keeping the same name and branding.) Meanwhile, Villanova will accept its outstanding invitation to move up from the FCS level since I just can’t see how anyone can turn down a BCS invite with the way college sports is heading. It’s not what I believe is the right thing to do for the Big East (as I personally believe that adding Villanova would be a mistake), but the tea leaves seem to indicate that this is the most likely outcome. The logistics of this expansion will be tricky because its basketball league has 16 members. That means to add two football programs, the conference either must go to 18 teams (or 17 if Villanova is one of the two football teams added) — which nobody seems to want– or eliminate one or two basketball members. That does not seem to be desirable, either. A third, but likely unrealistic, option would add two football-only members. Let me get this straight: nobody wants 18 schools, nobody wants 17 schools, eliminating basketball members is undesirable and adding football-only members is unrealistic. Well, that inspires a lot of confidence, doesn’t it? News is trickling out from the Big East meetings that the university presidents have agreed to expand to its football league to 10 members. (See Tweets from Stewart Mandel and Pat Forde.) The conference has temporarily refuted my pessimistic concern that it would elevate Villanova alone as opposed to adding TCU (which I thought was a no-brainer back in February), although there’s still plenty of time for the current Big East members to mess that up. If I were to guess today which 2 schools would be added, I’d say TCU and either Villanova (as a move-up from the FCS level to FBS) or Temple in order to keep some semblance of a Northeastern tilt. There also definitely won’t be a split between the football members and the Catholic schools. Without a Penn State/Notre Dame-type addition, there aren’t any potential football additions that would bring enough revenue to compensate for the loss of the large markets in the Big East basketball contract. I’m not saying those are the right decisions for the Big East – this is just my semi-educated prediction as to where I think the conference will end up. I’ll certainly be writing more about this story as it unfolds, but in the meantime, what does everyone else think?